Expedition to the End of the World - trailer from Haslund Film. A grand, adventurous journey to the last uncharted areas of the globe. Yet no matter how far we go, and how hard we try to find the answer, the ultimate meeting is with ourselves and our own transience. A real adventure film – for the 21st century. On a three-mast schooner packed with artists, scientists and ambitions worthy of Noah or Columbus, we set off for the end of the world: the rapidly melting massifs of North-East Greenland. An epic journey where the brave sailors on board encounter polar bear nightmares, Stone Age playgrounds and entirely new species. But in their encounter with new, unknown parts of the world, the crew of scientist and artists also confronted the existential questions of life. Teaser Ekspeditionen til Verdens Ende / Teaser Expedition to the End of the World from Haslund Film. Curiosity, grand pathos and a liberating dose of humour come together in a superbly orchestrated film where one iconic image after the other seduces us far beyond the historical footnote that is humanity. A film conceived and brought to life on a grand scale - a long forgotten childhood dream lived out by grown artists and scientists. Illusionist and stunt performer Harry Houdini was famously capable of holding his breath for over three minutes. But today, competitive breath-hold divers can squeeze ten, fifteen, even twenty minutes out of a single lungful of air. How do these divers do it — and how can you train to hold your breath for longer? World class waterman, surfer and free diver, Mark Healey talks about letting go. "My best static breath hold is pretty crap," says surfer Mark Healey in an article on breath-holding from the September 2011 issue of Surfer Magazine. "I think it's about 5:30." Martin Stepanek - the world top freediver in a film by Mirek Hrdy. A sample from the legendary film about the Czech freediving team and Martin's attempt to break the world record during the world freediving championship in Hawaii. But to the world’s foremost practitioners of "static apnea" – a competitive discipline in the sport of freediving in which a person holds his or her breath underwater, without moving, for as long as possible – five minutes is small change. In 2001, renowned freediver Martin Štěpánek held his breath for a then-unprecedented 8 minutes 6 seconds. His record stood for nearly three years, until June of 2004, when freediver Tom Sietas bested it by 41 seconds with a time of 8:47. The record has since been broken eight times (five of them by Sietas, himself), but the title currently belongs to French freediver Stéphane Mifsud. In 2009, Mifsud spent a lung-searing 11 minutes 35 seconds below water on a single gulp of air. Static apnea is the only discipline in freediving measured in units of time, but it is arguably the purest manifestation of the sport. It is also, inarguably, the skill most essential to the practice of the seven other sea- and pool-based disciplines officially recognized by the International Association for Development of Apnea, or "AIDA," the global sanctioning body for competitive breath-holding events. These events include "No Limit" (the "absolute depth" discipline, whereby the freediver descends with the help of a ballast weight and ascends via a method of her choice) and "Dynamic Without Fins" (whereby the freediver travels in a horizontal position under water attempting to cover the greatest possible distance in the absence of propulsive aids), and are measured in units of depth and distance. Other events allow for the use of fins, ropes, weights, sleds and even specialized vests with inflatable compartments, but every single one boils down to the athlete's ability to make the most that he or she can out of a single breath’s worth of oxygen. Freedivers subject themselves to years of training to achieve such breath-defying feats. In the process, they actually modify their biology. The oxygen you breathe is transferred to your blood and delivered to the various tissues of your body, where it is converted into energy. The waste product of this process is CO2, which is carried back to the lungs and released from the body upon exhalation. When you hold your breath, O2 is still converted to CO2, but the latter has nowhere to go. It recirculates in your veins, acidifying your blood and signaling your body to breathe, first with a burning sensation in your lungs, and eventually in the form of strong, painful spasms of your diaphragm. The blood of a seasoned free diver has been shown to acidify more slowly than those of us who spend our lives inhaling and exhaling reflexively. Activation of the sympathetic nervous system causes their peripheral blood vessels to contract soon after they stop breathing, thereby conserving oxygen-rich blood by redirecting it from the extremities to the vital organs, especially the brain and heart. Many freedivers also practice meditation to literally calm their hearts. Reducing the body’s metabolic rate attenuates the conversion of oxygen to CO2. Meditation has a calming effect on the mind, as well; much of the battle, when holding one’s breath, is mental. To know, logically, that your body can persist on the oxygen already available to it. To ignore outright the mind and body’s compulsion to breathe. Take “buccal pumping,” for instance, which was developed by spear-fishing breath-holders long ago and introduced to sport diving by U.S. Navy diver Robert Croft in the 1960s. Also known as “lung packing,” buccal packing involves taking the deepest breath possible, then using oral and pharyngeal muscles, along with the glottis, to hold the throat shut while shunting air, cheekfulls at a time, from the mouth down into the lungs. It’s been said that by repeating this pumping movement up to 50 times, a diver can increase his total lung capacity by as much as three liters. A 2003 study that measured the lung capacity of a breath-hold diver gives a more conservative figure, noting an increase following buccal pumping from 9.28 liters to 11.02. Lung capacity can also vary considerably from person-to-person: The average lung capacity is 4 liters for women and six for men, though acclaimed free diver Herbert Nitsch has a reported lung capacity of 14 liters. Then there’s hyperventilating, which divers often do to flush their systems of CO2 and pre-load their bodies, instead, with unconverted oxygen. The most extreme version of this technique involves breathing nothing but pure O2 for as much as 30 minutes before submerging one’s head beneath the water. The air we breathe is only about 21% oxygen (the rest is mostly nitrogen), which means that a breath held on atmospheric air will last significantly shorter than one held on pure O2. In this highly personal talk from TEDMED, magician and stuntman David Blaine describes what it took to hold his breath underwater for 17 minutes -- a world record (only two minutes shorter than this entire talk!) -- and what his often death-defying work means to him. This technique was how magician David Blaine managed to break the world-record for breath-holding in 2008, with a time of 17 minutes and 4 seconds, and how Stig Severinsen blew that time out of the water in 2012, with a mind-blowing performance of 22 minutes. All of these techniques and training methods carry with them a significant risk to one’s safety. Exceeding the limits of oxygen deprivation can lead to loss of consciousness or even to death, while extended exposure to pure oxygen carries its own set of risks. Hyperventilating can cause you to pass out, and there is evidence that suggests buccal-pumping can actually cause your lungs to rupture. It is for these reasons that freedivers rarely practice breath-holding unsupervised, or in or around even shallow water; after all: when you’re blacked out, it doesn’t matter how deep the water is. Nicholas Mevoli's life and death reflect the spirit, and dangers, of a niche sport that has grown exponentially. The jury is still out on whether repeated bouts of extended apnea is hazardous to your brain in the long term, but it should still give budding breath-holders pause to know that death is not unknown to freediving. The sport’s last major loss occurred last November, when 32-year-old Nicholas Mevoli died while attempting a record-setting free-dive of 236 feet. He was underwater for 3 minutes and 38 seconds, and while he returned to the surface by his own power, he lost conscious shortly after surfacing and was pronounced dead soon thereafter. Studies that predict future performance in competitive diving claim that there’s still a ways to go before the physiological limits of the sport are met, noting that current training methods and strategies suggest that duration can be prolonged still further. Divers, themselves, suggest the ultimate limit, unaided by oxygen, will be 15-minutes. AIDA’s official statement claimed that Mevoli’s death was the first in more than 20 years of its competitions. Given the pursuit of that 15-minute barrier, and other, more extreme diving performances, it’s hard to believe that his will be the last. Fukushima, by former ABC North Asia correspondent Mark Willacy. Three years ago today, Japan was hit by the strongest earthquake ever measured in that country – and Fukushima became an international by-word for disaster. Now, as Japan tries to put its past behind it, Fukushima is back in the news as hundreds of evacuees prepare to return to their homes near the crippled nuclear power plant for the first time next month. But how do any of us begin to understand a disaster that could mean 50,000 people never see their homes again? 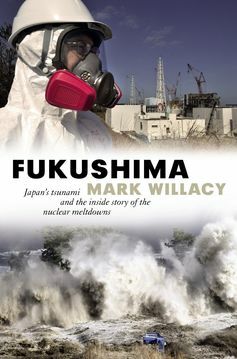 ABC journalist Mark Willacy’s Fukushima: Japan’s Tsunami and the Inside Story of the Nuclear Meltdowns is a very good place to start. On March 11, 2011, off the east coast of Japan’s largest island, Honshu, the sea floor heaved. In the city of Sendai water surged 10 kilometres up the valley of the Abukuma River. Sendai is the largest city in Tohoku, the northern region of Honshu, made up of six prefectures. The tsunami hit hardest in the three prefectures on the east coast: from south to north, Fukushima, Miyagi, and Iwate. ITN shows the moment Japan’s 2011 tsunami hit the Fukushima nuclear power plant. 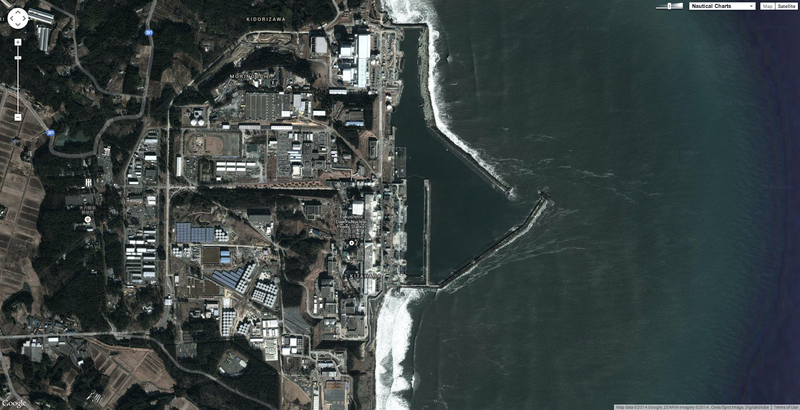 The Fukushima Daiichi (Number One) nuclear plant, one of several in Tohoku operated by the Tokyo Electric Power Company (TEPCO), was hit hard by the tsunami. A series of explosions spilled radioactive waste into air and water. 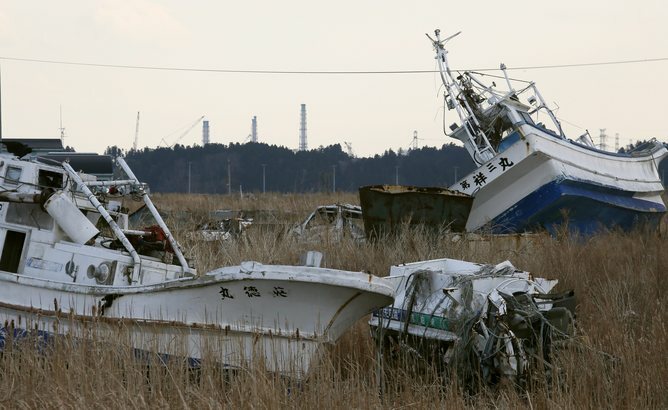 The leak has made towns and farmland near the plant uninhabitable: Fukushima prefecture has been devastated. Mark Willacy’s Fukushima is the story of the tidal wave and the nuclear disaster, told through interviews with farmers, fishermen, teachers, bureaucrats, and the then Prime Minister Naoto Kan.
Willacy opens out a range of views of and reactions to the disasters, the latter ranging from suicide to stoicism to single-minded recreation of a new life. There is a glossary and maps; a “cast list” would have been helpful, although this is offered in part by the captions to photographs. One of those photographs is a close-up of a woman looking serene, almost smiling; in a second photo she is almost unrecognisable as the intent operator of a mechanical digger. As her story builds, we understand why Naomi Hiratsuka obtained a licence to operate heavy machinery – a way of “doing something”, and of coping with loss. A picture is developed of what went on inside Fukushima Daiichi: interviewees include a worker who kept notes of key events; the plant manager; the leader of the elite metropolitan fire-fighting team who set up an emergency cooling system amidst deadly radiation; and senior bureaucrats, politicians and company managers in Tokyo, who thought they were calling the shots. The key factor in the nuclear disaster, as Willacy presents it, was the panic of those senior decision-makers, and their projection of this panic onto the population at large. This projection of hysteria onto those directly or potentially affected by radiation became a rationalisation for secrecy: better to keep others ignorant than alarmed. The same thinking, coupled with good old-fashioned greed, was at work in the limp or hostile response to warnings by academics about the potential dangers of a tsunami back in 2002, as well as warnings in 2006 about the vulnerability of the plant to inundation. Willacy’s arrangement of conflicting views reveals a pattern. He shows how those with authority in or over the nuclear industry placed their own profit or equanimity above the lives of others. The mendacity and malfeasance he reveals are in contrast to the courage and dignity often displayed by those faced with impossible demands, before and during the tsunami and the nuclear crisis. with the crippled Fukushima Daiichi nuclear power plant in the background. Willacy’s conclusion is that the Fukushima nuclear disaster was “man-made”: not in the sense that nuclear power plants are industrial constructions, but in that the location, design, maintenance, management, and regulatory oversight of the plant were badly flawed, as was the technical and political response to the disaster. The toxicity of radiation and of lies about radiation is one of two main themes in the book. The other is that “those who do not know their history are doomed to repeat it”. The symbol of that idea is a marker stone from an ancient tsunami, below which houses should not be built. The implicit questions: who will read the warnings on the markers? And who will listen to Willacy’s storytellers? In ordering the story, Willacy has a nice sense of perspective: Naomi Hiratsuka’s grief is as central to this story as the ambition of Prime Minister Kan. But there is a cruel contrast between the anger of the official whose lies or excuses collapse in interview, and the anger of the grieving family member. I lived and worked in Fukushima for several years in the late 1980s, teaching English mainly at high schools and sometimes at junior highs. Although I have not been back since the tsunami, what is constantly in my mind is the children of those whom I taught, physically and emotionally vulnerable to that radiation and to those lies. Even if you have never visited Japan, this is a mesmerising story, one I hope more people will revisit, even as memories fade of watching black waves inundate Japanese coastal cities, sweeping away cars, office towers and homes. Iridium Communications Inc. and Rutgers University's Coastal Ocean Observation Lab today announced Iridium will be a key technology sponsor to the Challenger Glider Mission. The project, a symbolic re-creation of the first global scientific ocean survey conducted by the HMS Challenger in 1872, is led by Rutgers' students and faculty. The mission plans to "fly" 16 autonomous underwater gliders worldwide, covering all five ocean basins, collecting an unprecedented undersea dataset to better equip researchers with the tools to predict the ocean's future and its impact on global weather. "The health of our oceans is truly an indicator of the health of our planet, and the Challenger Glider Mission will provide the kind of high-resolution data desperately needed by researchers to evaluate and assess the current ocean state," stated David Wigglesworth, Vice President & General Manager, Americas and Global M2M Services, Iridium. "We're thrilled to be associated with the project, and excited to provide connectivity via the Iridium(R) satellite network for this endeavor. Our products and services uniquely provide reliable and global coverage, with a small form factor, which are all obvious necessities for the success of this mission." The Challenger Glider Mission will be conducted from 2014 to 2016 through coordinated flights of the core glider fleet plus volunteered gliders from other academic and government institutions. 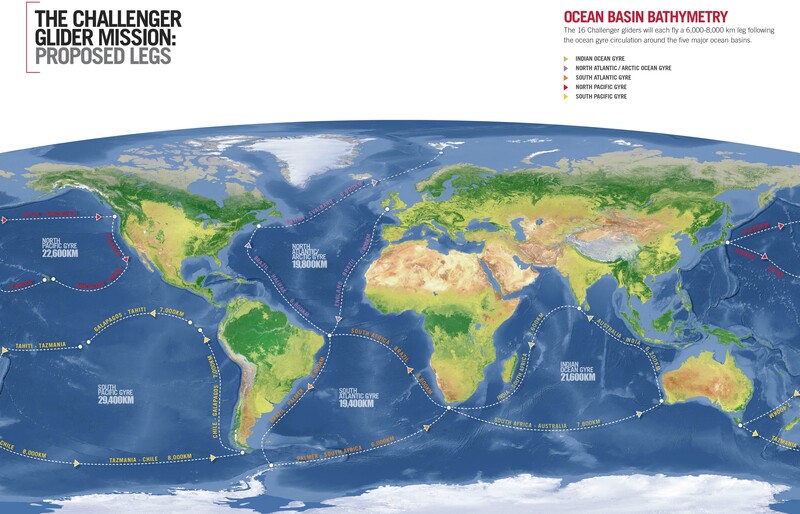 Each glider will fly a 6,000 to 8,000 kilometer leg following the ocean gyre circulation around the five major ocean basins. The global-class gliders used in the mission - the Teledyne Webb-Slocum glider - is a 2.2 meter autonomous underwater vehicle that collects data as it moves through the ocean in a saw-tooth shaped gliding trajectory, achieving a forward speed of 25 to 35 kilometers per day. The primary vehicle navigation system uses an onboard GPS receiver coupled with an attitude sensor, depth sensor, and altimeter to provide dead-reckoned navigation. Iridium, through its global satellite circuit switched data service, provides primary two-way communications. Each 2.2 metre-long glider will rely on the energy from buoyancy changes to propel it forwards at speeds of around 35 km per day as it navigates using altitude and depth sensors, a GPS receiver and altimeter. The drones will continually collect data about the oceans' currents, temperature and salinity to improve the accuracy of current climate and weather forecasting. "We're pleased to be working with the Challenger Glider Mission and Iridium on what is an extraordinary project," said Bill Woodward, President and CEO, CLS America, Iridium's partner that provides the technical and administrative communications interface between the gliders and the Iridium system. "The Teledyne Webb-Slocum glider, paired with the the Iridium satellite network, is a fantastic solution for this kind of research.The results of this mission will be invaluable to the research community, which in turn will have a profound effect globally on many industries.For one example, a better understanding of the changing oceans will benefit the maritime industry, as it could lead to improved weather and ocean condition forecasting." Each glider will capture continuous readings of ocean temperature, salinity and currents. This data will be transmitted to researchers via the Iridium satellite network when the glider surfaces. Iridium's network is uniquely suited to these kinds of applications, given its low latency, superior availability and reliability. Furthermore, Iridium's near-polar orbit means it is the only satellite network to provide truly global coverage, an essential for projects that span the globe, such as the Challenger Glider Mission. Additionally this is a great demonstration of the low power consumption of Iridium transceiver technology and its robustness in what can be an extreme environment. "The technology underpinnings of this mission are truly enabling our researchers to gather more and better data than ever before, enhancing the basis of knowledge for future generations," said Scott Glenn, Co-leader of the Challenger Glider Mission and Professor of Physical Oceanography at Rutgers University. "Part of our goal with this mission is to increase global ocean literacy. This expanded dataset will enable students and researchers to focus on the science of their local waters, as well as be a part of a global research community, all working toward understanding the ocean's role in regulating the changing climate and weather." 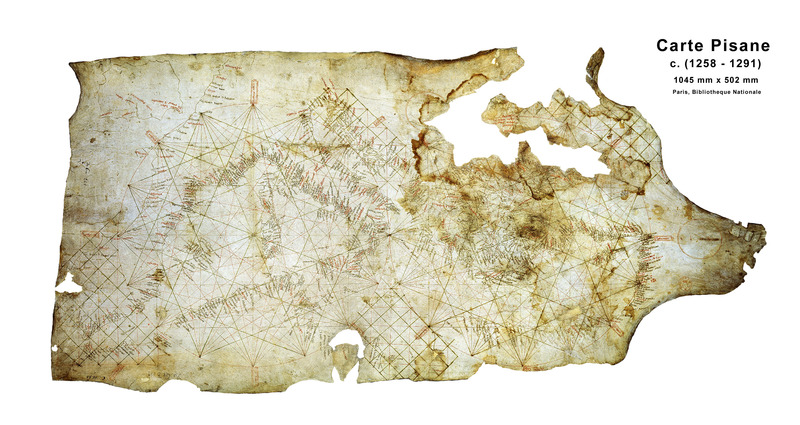 Portolan charts, it was always assumed, were compiled by medieval European mapmakers from contemporary sources. A Dutch doctoral dissertation now disproves this: these nautical charts are impossibly accurate, not just for medieval Europe, also for other likely sources, the Byzantines and the Arabs. So who made them – and when? Mystery has always shrouded the sudden emergence, seemingly ex nihilo, of portolan charts. The oldest known example emerged in Pisa around 1290, without any obvious antecedents. This Carta Pisana kickstarted a tradition of amazingly accurate sea charts almost up to modern standards, although as with most other portolans, that accuracy was mainly limited to the Mediterranean and the Black Sea. 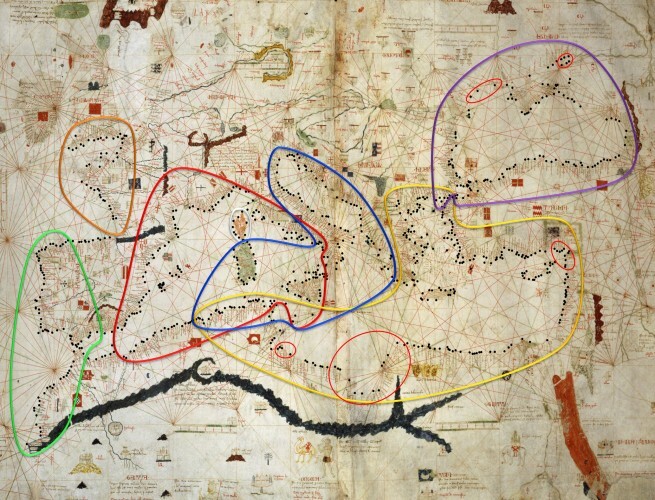 A picture of the Carta Pisana, a map made at the end of the 13th century, about 1275-1300. A typical portolan chart showed coastal contours and the location of harbours and ports, ignoring virtually all inland features. It would be criss-crossed by straight lines, connecting opposite shores by any of the 32 directions of the mariner's compass, thus facilitating navigation. That hypothesis has now been disproven by Roelof Nicolai, a Dutch geodetic scientist who on 3 March obtained his doctorate degree from Utrecht University for a dissertation titled A Critical Review of the Hypothesis of a Medieval Origin for Portolan Charts. In it, Nicolai puts forth the theory that portolan charts were made using techniques that were not at all available to medieval Europeans. So they must have copied them from unknown older sources – in all likelihood while failing to grasp how accurate those maps really were. Nicolai demonstrates that portolans achieved their accuracy by using what seems like an early version of the Mercator Projection – almost three centuries early. Only in 1569 would the Flemish cartographer introduce his mathematical method of projecting spherical data onto a flat surface that would prove crucial to navigation (straight lines on the map equal straight lines at sea). In blue: portolan shorelines; in red: actual shorelines. A close match in the Mediterranean and Black Seas, wildly off the mark in the British Isles and the Baltic. “The portolan maps I've researched all seem to be made using the Mercator Projection”, Nicolai says. “They've all clearly been produced on medieval parchment, but those mapmakers probably didn't realise the accuracy of the maps they were producing. We immediately recognise the shape of the Mediterranean, but even in the Late Middle Ages, that shape was far from established on maps. Nobody really knew how all of the Mediterranean's shorelines ran”. The doctorandus also tried to replicate the presumed method by which portolan charts were produced, by averaging the data from numerous single sailing records detailing the location of harbours, the directions of sail, etc. The resulting accuracy was worse by a factor of 10 to that of the actual portolan charts – even while using methods of calculation averages that were developed only at the end of the 17th century. Only in the 19th century did cartographers manage to re-achieve the accuracy of the portolans. So who was the producer of this anachronistic accuracy? Nicolai only points to the likely source of the maps: Constantinople. “But it is highly unlikely that they were produced there as well. As far as we can tell, the Byzantines really didn't add much to the scientific knowledge inherited from the Classical Age. They only acted as a repository for ancient Greek and Arabic knowledge. And why would the Byzantines even try to chart English and French coastlines? Those were way beyond their sphere of interest”. Could portolans have an Arabic background? After all, the Arabs were keen astronomers and navigators, giving us the nautical rank of admiral (from 'Amir al Bahr', ruler of the sea). But Nicolai contends the accuracy of the portolans transcends the Arabs' navigational ability of the time. And what we know of Roman and Greek scientific knowledge, for that matter. Until we reach the alien ship that left behind the first portolan maps, of course. 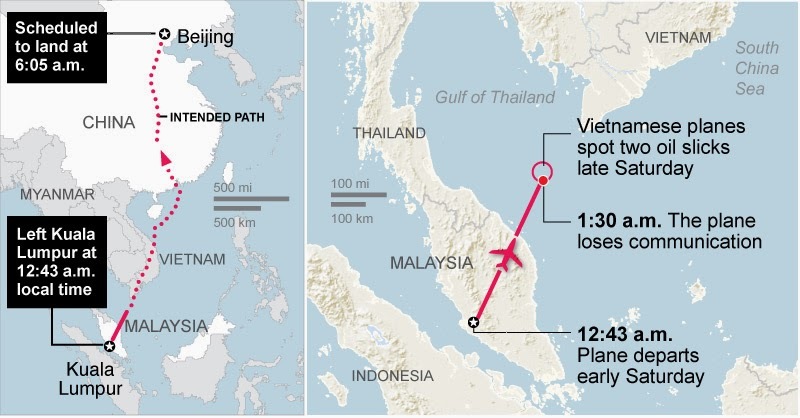 The Beijing-bound Malaysian Airlines flight MH370 disappeared on March 8 over the South China Sea between Malaysia and Vietnam after it lost contact with the ground controllers. 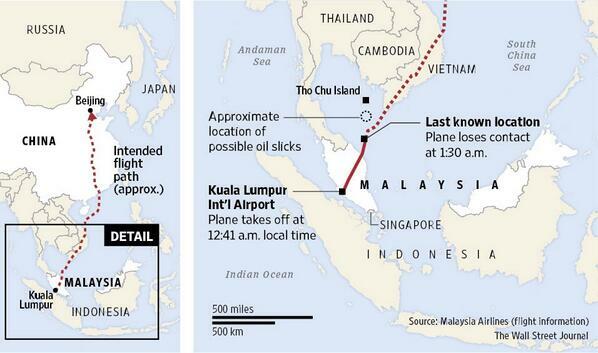 There are still no clues about the whereabouts of the missing plane. 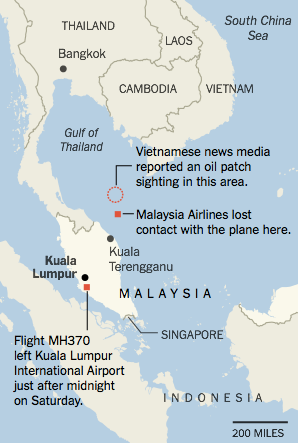 Malaysia Airlines said it was working with authorities who activated their search and rescue team to locate the aircraft. The route would take the aircraft from Malaysia across to Vietnam and China. The Boeing 777 was traveling smoothly in clear weather at about 35,000 feet, when it vanished from radar screens. Its last known location was captured on Flightradar 24, a popular aircraft live-tracking site, over the South China Sea/Gulf of Thailand almost due north of Kuala Terengganu in Malaysia approximately 45 minutes after take off. 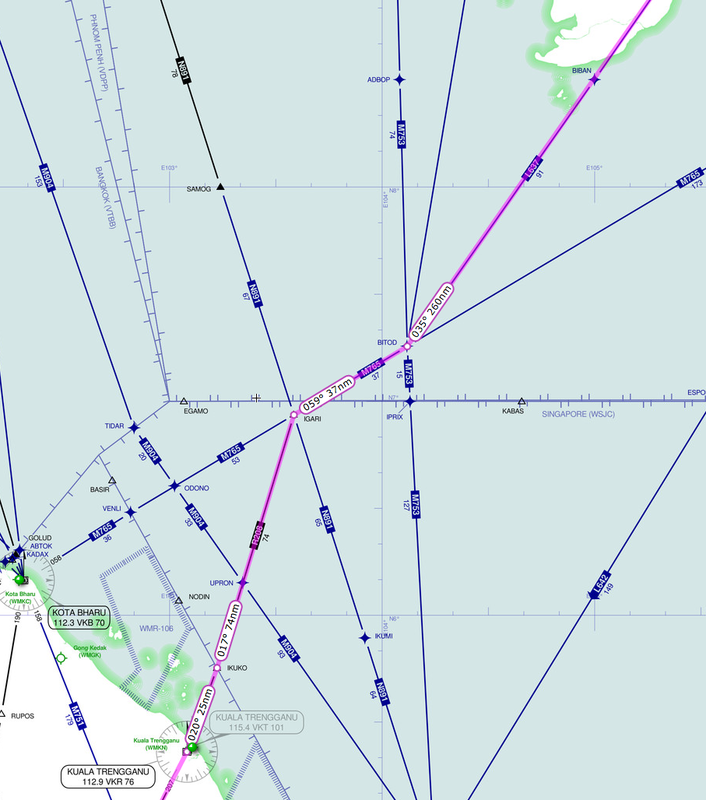 Last detected signal was reported to be 120 Nm from east Kota Baru. Vietnam navy said plane may have crashed 153 miles off Tho Chu island. The bathymetry of this SE Asia area shows an extensive shallow water. 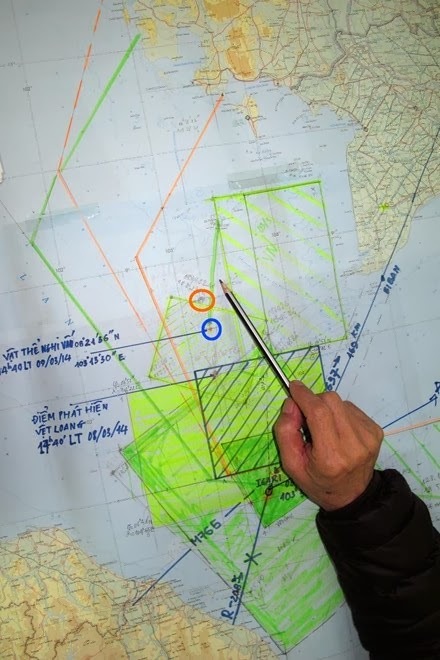 Given the relatively shallow depth of the Gulf of Thailand, the possible crash area, the flight-data recorder (or "black box") and cockpit voice recorder should be located fairly quickly -- a key difference between Malaysia 370 and the similarly baffling Air France 447, which went down in 2009 in the middle of the Atlantic at a depth of 4,000 meters. with this area being the current area of interest. View of oil spills seen from a Vietnamese air force plane on Saturday in the search area for a missing Malaysia Airlines jetliner carrying 227 passengers and 12 crew members. Preliminary investigations into the whereabouts of flight MH370 are said to be narrowing on the possibility of a mid-air disintegration. A photo taken by personnel on board a Vietnamese search aircraft in an undisclosed area on March 9 shows possible debris from the missing Malaysia Airline. 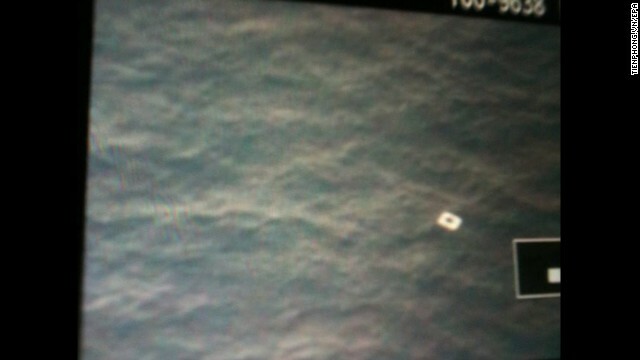 Vietnamese officials said they believe the object is one of the plane's doors, according to local news media reports. GeoSage, a developer in image fusion and spectral transformation analysis, is suggesting that Landsat-8 satellite imagery might come to rescue in this case. However, there are no readily available maps for the vast and empty ocean. Though satellite imagery (Landsat-8) acquired for the same day can be rapidly explored. 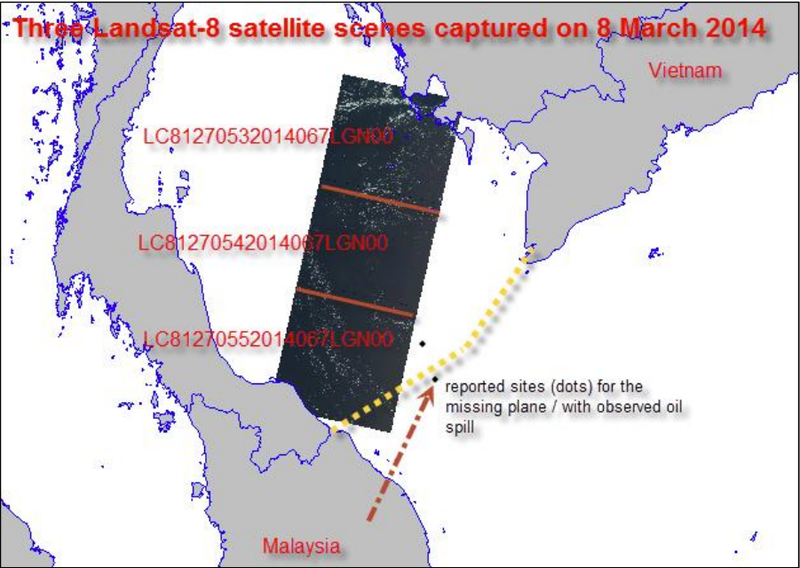 It would be a good opportunity to explore whether the timely Landsat-8 satellite imagery has captured something for the surrounding ocean region where the plane was reportedly missing. Luckily, there are three scenes captured on the same day for the surrounding ocean region. Unfortunately, no imagery is available for the main suspect area. Nevertheless, given the surprisingly lack of any information and useful maps, the Landsat-8 scenes that are now processed (at 15m-resolution) might still be useful for the swift search and possibly rescue exercises. At least, with the satellite imagery the search can be more targeted and one can exclude large areas without any traces at this stage. 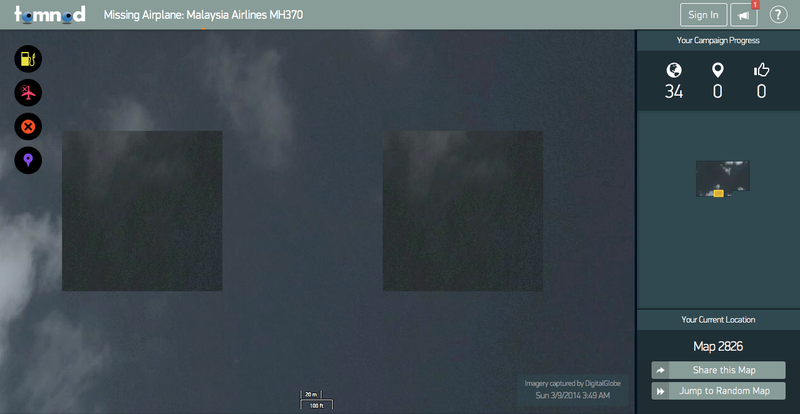 Want to help find the Malaysian Airlines flight? with images captured by Digital Globe on Sunday 9 March. DigitalGlobe is enlisting the crowd to scan and tag images of more than 1,200 square miles of ocean for any visible evidence that could help locate the Malaysia Airlines 777 aircraft that went missing this weekend. The Longmont-based earth-imagery company deployed its FirstLook service on Sunday, directing two of its five satellites to snap photos of the area in the Gulf of Thailand, where investigators suspected the plane may have crashed, and then activated its crowdsourcing platform, Tomnod. A lot of ocean to cover, they need a lot of eyes. According to N.O.A.A. Southern California has the greatest density of dolphins in the world. We have pods up to 10,000 strong stretched out for miles like the wildebeests of Africa. Over 400,000 common dolphin alone. We also have the largest concentration of blue whales on earth. Capt. Dave had to film this off a small inflatable boat, launching and catching the quadcopter drone by hand where a miss could mean injury to him from the four propeller blades or loss of the drone. He actually lost one drone on takeoff when it nicked his small VHF radio antenna on the 14 foot rigid inflatable he was filming from and it went into the water. Alone six miles offshore Capt. Dave, without thinking, dove into the cold, late-January waters off Dana Point to retrieve the valuable footage taken on a flight a half hour earlier that morning. "I had my hat and glasses on, I was fully clothed with long-johns on to keep warm and my cell phone and wallet in my pocket," Captain Dave explained. "It was a stupid move, but the copter started sinking so fast it was my only hope to get the amazing footage I had just shot". Since then he has attached flotation to the skids, which would save the footage, but every flight over the water still risks the DJI Phantom 2 quadcopter with a small GoPro HERO3 Black camera on it, as the $1,700 rig is not waterproof and the skids will not keep it upright on the ocean. Entanglement in fishing gear takes the lives of nearly 1,000 dolphins and whales ever day around the world. Captain Dave formed Orange County's first whale disentanglement group in 2008 and has been involved in disentangling several whales, including a gray whale named Lily, whose disentanglement in Dana Point Harbor made national headlines. He authored the award-winning book, "Lily, A Gray Whale's Odyssey", which won eight awards in 2013 including the prestigious Benjamin Franklin award for Best New Voice from the Independent Book Publishers Association. Attention any would be whale videographers: please only attempt this if you are extremely familiar with whale behavior as it is illegal to do anything that causes the whales to change their normal behavior with big fines- and the authorities do watch YouTube. 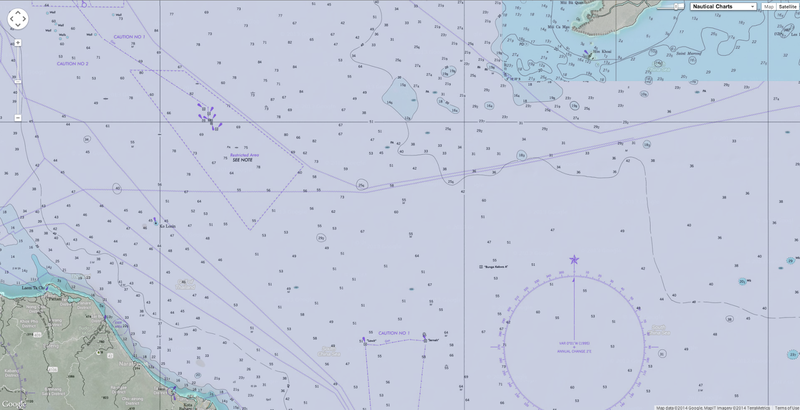 Different areas have different laws on approaching whales. I am a whale watch captain with nearly 20 years of experience. All laws were obeyed by us during filming. In Maui we sat watching whales from a distance for hours before they moved closer to us. You can never approach them there closer than 100 yards. The Mom and calf as you can see in the film were completely undisturbed by the small drone. NOAA is currently reviewing drones and may create laws or guidelines for using them around whales.